I haven’t busted any stash this week. I must confess that last Sunday, after I posted my weekly report, I ordered three BOLTS of fabric. Hey, it was on sale! $2.50 a yard for two of them, $2.75 for one. One is a beautiful Hoffman print, one is Robyn Randolph, and I don’t remember what the other was. I ordered them mostly for quilt backings. I haven’t rec’d my order yet, but when I do, I will post a pic. I ordered them from http://www.fabric4less.com/, after receiving not one, but two emails tempting me with their big sale. I did my weigh-in this morning. Last week I was 145, and today I was 144. I really don’t know how that happened, as I have yet to get back to exercising. Maybe just because I’ve been so darn busy. 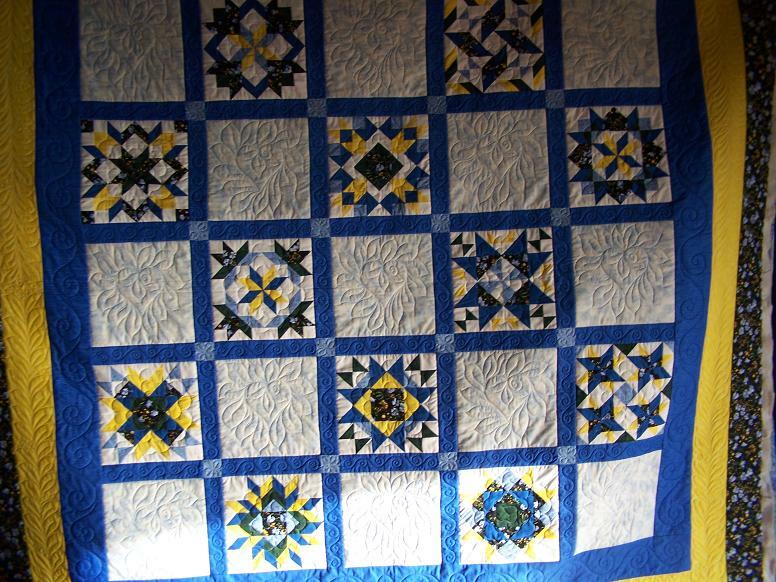 I have made lots more progress on the quilt I’m quilting. I leave you today with some more pics of it. It’s looking really good!!! I personally think longarm quilting is a fabulous workout 😉 Happy Easter!! Thanks, Jan! It must be a good workout, as it’s about the only one I’ve gotten lately. The quilt is looking wonderful Randi. Can’t wait to see it finished. The quilt is looking marvelous darlin’. And where are getting bolts of fabric for $2.75/yd??? oops, it should be where are YOU getting yada,yada. 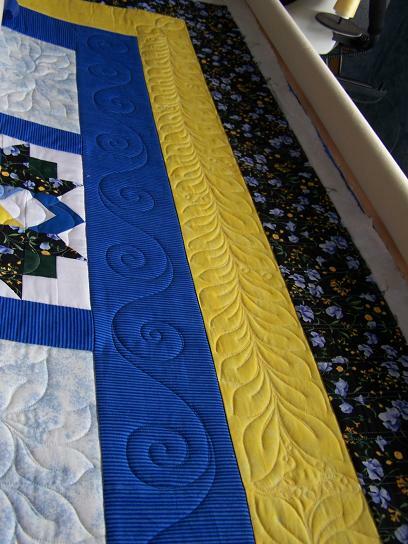 Do you use a ruler to get those perfectly spaced spirals in the blue sashing and border? It looks great! I replied to Vicki privately, but for anyone else that might want to know….I just drew out the curlicues with a chalk pencil first, then stitched away. Now I’m thinking I could’ve used a wavy ruler to mark the spine…I might have to try that next time! I love the way your leaves look, Randi. I think I need to give those a try. Yup, with all that I do, I haven’t tried “leafing it”. 😉 Beautiful work, as always! Leaves are lots of fun, Lynn! Randi – absolutely breathtaking! You weren’t in Kim’s leaf book for nothing!!!!!! I love your quilting!!! Thanks for sharing, it’s so inspiring to see others work. I was wondering if you would mind if I “tag” you in my upcoming post? Thanks! Another awesome job, I love the hearts and the leaves. Great work! Glad I found your blog. 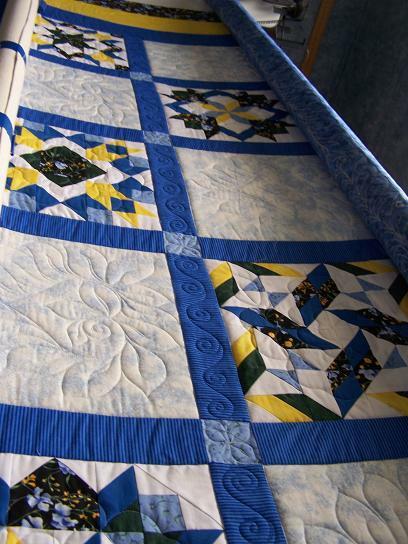 Amazing quilts and quilting!